Next to the pansies, violas, and primroses that garden centers like to put out after the vernal equinox, fuchsias make their season debut. These flowers are a staple in British gardens, as they love the mild summers and gentle rains that mimic their native habitat of the mountainous regions of Central and South America. Although they are not a plant-it-and-forget-it type of flower, anyone can grow fuchsias with the help of some high-quality potting soil and a partly sunny site sheltered from the wind. From more than one hundred species and many more hybrid types, you can find a fuchsia to add an exotic touch to your hanging baskets and containers. Blooming equally well in sun or shade, the red and purple blooms of the "Dollar Princess" fuchsia blends well with warm and cool color schemes. In spite of its exotic appearance, "Dollar Princess" is a hardy fuchsia that can survive winter temperatures down to 5 degrees F. The shrub produces woody branches that are part of its permanent structure, and new tender growth will emerge from these branches in the spring. To increase the chances of winter survival in cold areas, remove all dead foliage and pile mulch and leaves around the base of the plant. Wet soggy winter soils cause root rot and death, so fuchsias in raised beds have a better chance of survival in these garden situations. While garden centers tout the new and improved hybrids each year, sometimes the simplicity of a species plant is most satisfying. When you grow the Boliviana fuchsia, you will get the same results each time: a fast-growing plant that blooms its heart out from June to September, sporting merry clusters of red flowers that sound the dinner bell to hummingbirds. The Peruvian native even produces an edible fruit following the flowers, although the scant flesh proves to be more of a novelty than a side dish. The sheer exuberance of a Paniculata fuchsia in bloom is captivating, as its vibrant pink flowers and ornamental berries are produced on erect shrubs that can live for 20 years in the right conditions. It demands mild, frost-free temperatures and acidic soil high in organic matter. With it's slow to medium growth habit, fuchsia Paniculata is a good candidate for training as a tree standard. 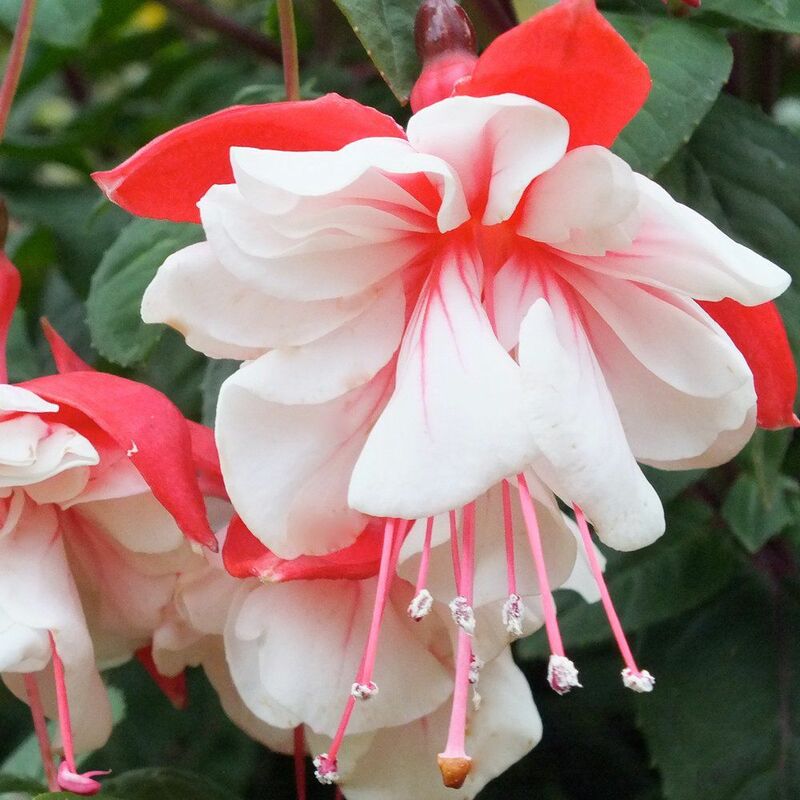 Fuchsia "Alba" is an elegant addition to the white flower garden. The blooms aren't a stark white, but a creamy pink that nevertheless look luminous under a full moon. Bi-weekly deadheading will encourage repeat blooming through fall.